It’s January. It’s cold outside. In most parts of the country, the weather is pretty crappy. It still gets dark pretty early in the evening. It’s Friday afternoon. And you-know-who is now the president. All of the above means that we deserve some MAJOR comfort food. I almost didn’t post this recipe. Almost. The lighting on the day I cooked it was REALLY bad, to the point where there was barely any sunlight outside at all and very little natural light to shine on the food. All my fellow food bloggers out there know that shooting pictures of monochrome ‘brown’ foods like beef are difficult enough as it is, but without sunlight? Eh. It’s not picnic, I’ll tell you. But ultimately I decided, what the heck? It’s a few hunks of beef. I think it looks like a few hunks of beef. Maybe not as pretty as they could be, but what makes a dish at the end of the day is the taste. And I promise you, it does not fail to deliver on that. There’s not many bells and whistles to this dish. It takes the sweet and tangy flavors that remind me of barbecue and infuses them into a hunk of beef that is cooked low and slow in the oven until fork tender. It’s no grilled so we obviously don’t have that charred, charcoal flavor, but…it’s still pretty great stuff. In fact, upon tasting, my older sister remarked that the sauce that it produces is VERRRRRRY close to the homemade barbecue sauce that our grandmother always made for holidays when we would grill out. Which suffice to say, is very high praise indeed. The low roasting temp makes the beef come out so juicy, moist and tender. The sauce that it makes is the perfect blend of sweet and tangy flavors. It made for an absolutely delicious sandwich, guys. I mean, wow. I ate mine with caramelized onions and peppers and pickled gherkins, as pictured. But however you’d like to eat it, I guarantee you’ll be satisfied. Linking this post up to Fiesta Friday #155. Y’all be easy. In a small bowl, combine the onion powder, smoked paprika, pepper and seasoning salt. Rub the mixture evenly over both sides of the meat. Heat the oil in a large Dutch Oven or pot over the stove over medium high heat. Just before it starts to smoke, sear the meat in the pot until a crust forms on surface, about 3-5 minutes per side. Remove the meat to a plate and cover with aluminum foil. Set aside. Place the onions and green pepper together in the Dutch oven and sauté them in the residual oil and drippings until just tender/translucent. Add the garlic and cook for about one minute more until the garlic is fragrant. In a medium bowl, combine the barbecue sauce, vinegar, broth, mustard, Worcestershire sauce, and chili powder. Pour into the Dutch oven and bring to a boil. Remove from the heat. Add the meat back into the pot, cover and place in the oven. Roast for about 3 to 4 hours, until the meat is fork tender, turning the meat every hour or so. Let the meat stand in the pot for about 30 minutes. In the meanwhile, drain off about 2 cups of the liquid from the pot and place in a small saucepan. Bring the liquid in saucepan to a boil, then reduce heat to medium low and allow to simmer until thickened into a sauce. Skim off the fat on the surface, then serve with the meat. This roast looks and sounds delicious and very full of flavor! I can totally relate to the low lighting and the challenges of photographing food in the gloomy light! Your photos turned out great! Thank you Jenny, I was really kinda dissatisfied with the pictures at first so I really appreciate that. I struggle taking good pix and am signing up for a photography class soon. Always the prettiest pictures with the most mouth-watering flavor combinations! This looks so good!!!! The picture got me to read and now I need it in my life!!!!! And invite me to the wedding, lol!! Omg! That looks so good! I’ve been looking for a good recipe for pot roast. I’ll have to test this out. This is one beautiful cake, Jess. Your niece is lucky to have such a talented baker and loving Aunt in the family! 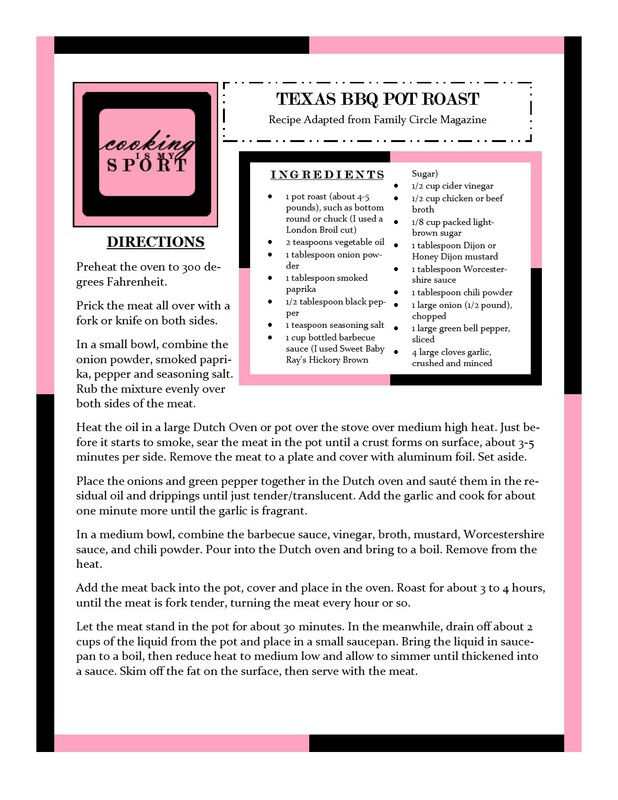 Ooo this looks so yummy and my boyfriend loves Texan BBQ, so I think I will have to give this a go! If you have time, be sure to check out my latest blog post at https://tootinghustle.wordpress.com/2017/04/24/to-the-left/ and let me know what you think! I hope your boyfriend likes it, thanks! hot damn, this looks good!